The UI booth at the Iowa State Fair was once again a big hit with fairgoers, thanks to the volunteer efforts of UI faculty, students, staff, alumni, and friends. Photo by Michael Benning. Thank you to University of Iowa faculty, staff, students, alumni, and friends who volunteered to greet fans and fellow Iowans at the 2018 Iowa State Fair in Des Moines. Without generous volunteers willing to share the Hawkeye spirit, the UI would be unable to have such a welcoming presence at this important event. Volunteers handed out tens of thousands of football posters, Tigerhawk tattoos, pencils, and reusable bags to visitors. 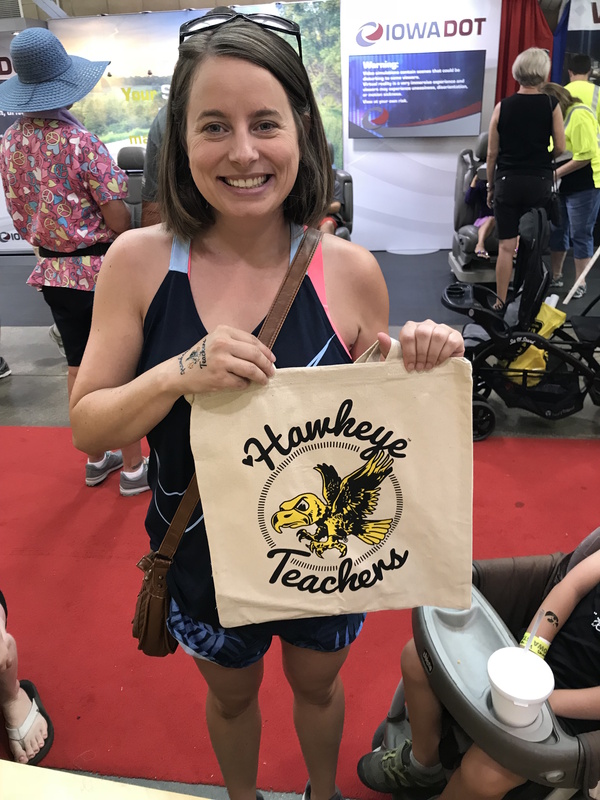 The College of Education gave out hundreds of tote bags to teachers as a special sign of appreciation, and Office of Admissions representatives were on hand throughout the fair to answer questions. The College of Education gave out hundreds of tote bags to teachers as a special sign of appreciation. Photo courtesy of the College of Education. Several campus units set up special exhibits for fairgoers. Among them, the College of Pharmacy taught children to tell the difference between candy and pills, the Department of Chemistry guided children through science experiments, and researchers from the National Advanced Driving Simulator set up a portable driving simulator so visitors could text while “driving” and learn the dangers of doing so. Herky and the Iowa Spirit Squad returned as special guests at the booth, as did former wrestling coach Dan Gable, gold medalist in wrestling at the 1972 Olympics. Other special guests included Ed Podolak, UI alumnus, sports commentator, and former running back for the Kansas City Chiefs; Gary Dolphin, the noted “Voice of the Hawkeyes” commentator who partners with Podolak for Iowa football and men’s basketball games; and Chuck Long, UI alumnus and former Hawkeye quarterback under coach Hayden Fry and former player for the Detroit Lions and Los Angeles Rams. The UI booth also displayed trophies won by the UI this last year: the Floyd of Rosedale, the Cy-Hawk and Cy-Hawk Series trophies, the Heroes Trophy, the George M. Steinbrenner Trophy for the Pinstripe Bowl, and the 2017 Disney Sports Spirit Award, which recognized the “Kinnick Wave” at Hawkeye football home games last season. A bust of Nile Kinnick by Dora Mason, sculpted shortly after Kinnick received the Heisman Memorial Trophy in 1939, also was on display.